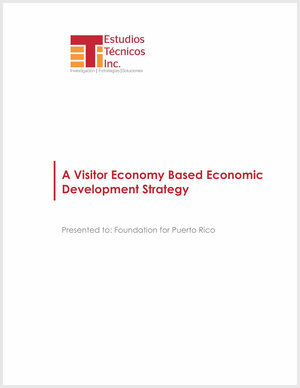 FPR and EstudiosTécnicos, Inc. have partnered to integrate the concept of the Visitor Economy into a broader economic development strategy framework.This project seeks to identify the supportive elements required for a robust visitor economy under the Island’s current economic conditions while posting practical insights on how the visitor economy interacts with the local economy. Thus, rather than equating visitor economy to tourism, this report provides the basis for a broader visitor economy. This translates to a greater emphasis on its interrelation with the domestic economy and its capacity to become a robust economic development tool. The following report provides a new conception for the visitor economy in Puerto Rico, analyzes the experiences in other jurisdictions and provides an assessment of such understanding within the local economy.